Tucan Olive Oil | Halifax Seaport Farmers' Market Ltd.
Tucan Olive Oil sells high quality extra virgin olive oil from Tunisia. 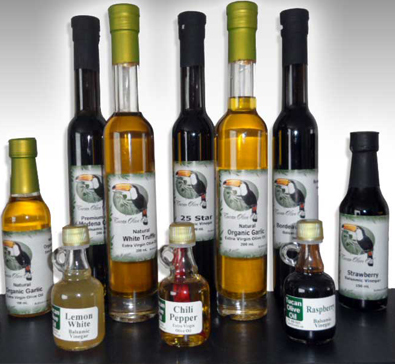 Their products include: conventional olive oil, organic olive oil, infused olive oils and infused balsamic vinegars. With 56 million feet of olive trees and 1,440 olive oil mills, Tunisia is the fourth largest producer of olive oil in the world with 157 thousand tons produced per year with 70% of it exported. Demand for Tunisian olive oil, known for its quality, has increased dramatically in recent years. There has been an enormous increase in exports, particularly because of the access of Tunisian olive oil to new markets such as the USA, Canada and Japan. Find Tucan Olive Oil at the Halifax Seaport Farmers’ Market every Saturday and Sunday!